Recently I was sent some vouchers to buy some Little Dish Meals. I popped to the local Waitrose supermarket to find some. I find it important for us to make sure that Maxwell has a balanced diet which is healthy as possible. We try to make as much home-made food as we can. Sometimes I find it hard to cook a meal from scratch so I was happy to give these quick and easy meals a try. Our local supermarket is not huge so we didn't manage to get all the meals that Little Dish have to offer however we managed to pick up Chicken and Butternut Squash Pie and Pasta Bolognaise. We managed to get 4 meals, 2 of each. The packaging which the meals come instantly stood out at me. It is brightly coloured and shows clear wording which makes it easy for people to see which each meal is. Each meal also includes a character on the packaging which is a great idea for little children. 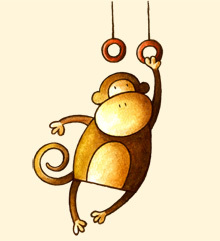 I especially love the fact they have Max the monkey! The packaging includes a fun activity for the child to enjoy doing perhaps when their meal is being prepared. Maxwell tucked into his Pasta Bolognaise and looked to be enjoying it. The Pasta Bolognaise dish is made up with Macaroni pasta with great British beef mince in a fresh tomato sauce. Little Dish purée 5 vegetables into this tomato sauce to make it as nutritious as possible. The sauce makes up one of your child's vegetables a day. When Max ate the Pasta Bolognaise he seemed happy to eat it. The pasta was the perfect size for him and there was not a chance that he was able to choke on the pasta pieces. Maxwell ate the whole dish. We added a little sprinkle of cheese over the top just to give it a little more flavour. Chicken is not normally Maxwell's favourite dish to eat. He normally finds it hard to chew the chicken, however Little Dish proved once again just how great there meals are. Once I had heated the meal up, Maxwell looked keen to tuck in. The chicken was cut into tiny chunks which where the perfect size for him. The butternut squash provided a sweet flavour and the mashed potato topping was lovely and creamy. When trying Maxwell's meal to see how hot it was, I was surprised at how well it tasted. I think Little Dish should bring out parent ones. 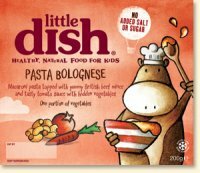 Overall Little Dish meals are great quality and are always guaranteed to go down well with many children. There is a huge range to choose from so there is something out there for everyone. Little Dish meals are the perfect solution you need to produce a quick and easy meal. 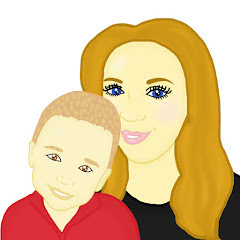 All the ingredients are 100% natural and the Little Dish meals are healthy for children. They are not priced expensive. When we got them on offer they worked out cheaper than some other meal options we have tried with Maxwell. 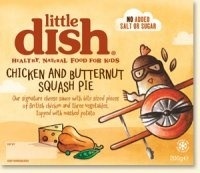 Head over to Little Dish Facebook or their Twitter account to find more information and join in lots of fun.